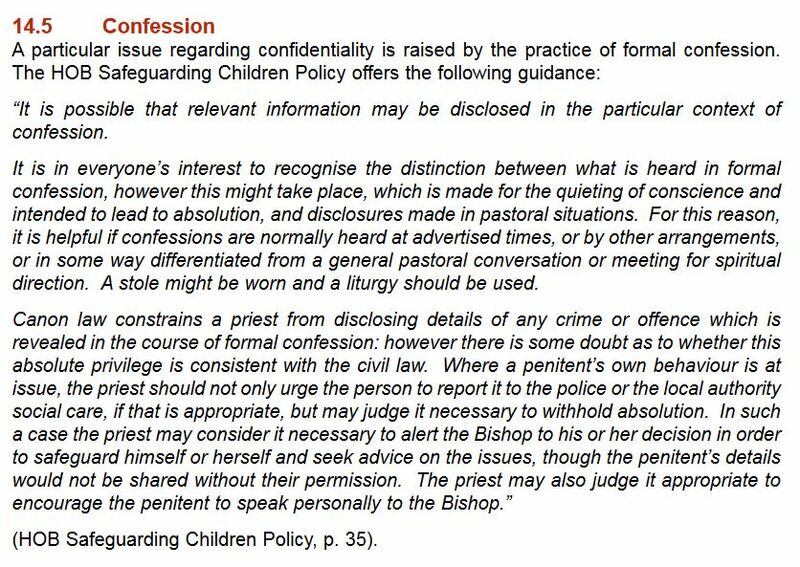 It their guidelines for Safeguarding Children and Young Adults from Harm, the Diocese of Canterbury has apparently abolished the Seal of the Confessional. No longer may the penitent sinner confess his or her vices and crimes to a priest in the sure and certain knowledge of ecclesial probity and pastoral confidentiality; henceforth, if the priest hears something which touches on another person’s ‘wellbeing’ or ‘safeguarding’, you can expect to be reported to the police or social services or the RSPCA (for why should concern for wellbeing stop with humans?). There is a world of difference between the priest exhorting the penitent to report themselves to the police (or social services, or the RSPCA, etc.) as a contiguous act of penitence, and the priest actively doing the reporting (beyond, that is, to a bishop, as the higher spiritual authority). True repentance may have temporal consequences and demand restitution, but is it really for the spiritual authority to ensure that the temporal authorities are informed of a debt that needs paying? What, then, actually happens in the confessional after the sinner’s guilt and shame are admitted? Is absolution withheld until the priest has handed the penitent over to the relevant authorities? Is the act of reconciliation somehow suspended pending the priest finding time to visit the police station? The Guidelines [for the Professional Conduct of the Clergy] refer to a working party on the seal of the confessional, charged with considering whether proposals the proviso to Canon CXIII should be amended. Forward in Faith made a submission to that working party, arguing for no change. It’s on the website (www.forwardinfaith.com/Confession.php). We pointed out that repealing the proviso would not remove the duty of non-disclosure, because it is integral to the Sacrament. In any case, the Sacraments belong to the whole Church and the Church of England does not have authority to alter them unilaterally. We also pointed out that removing the seal would discourage confession of crimes against children and vulnerable adults (which of course are uppermost in the minds of those who argue for change), and thus serve to remove the opportunity for a priest to encourage a perpetrator to report him – or herself to the Police (withholding absolution until this has occurred). Even if the working party were to recommend amendment, which seems unlikely, I think legislation would be fraught with difficulty and unlikely to succeed. That this House reaffirms as an essential principle of Church doctrine that if any person confess his secret and hidden sin to a priest for the unburdening of his conscience, and to receive spiritual consolation and absolution from him, such priest is strictly charged that he do not at any time reveal or make known to any person whatsoever any sin so committed to his trust and secrecy. When was this revised? When was Canon 133 repealed? Who in Canterbury is making up guidelines on the hoof without any apparent regard for the pastoral implications of threatening to report sinners to the police if, in the subjective judgment of the priest, another person’s ‘wellbeing’ may have been compromised? Who, just who, would unburden their consciences to a priest they don’t know with powers of discernment unknown if there’s a vague possibility of a visit from Mr Plod because a child’s ‘wellbeing’ was possibly infringed when you smacked him and forced him to eat his sprouts? Priests thereby become state spies: every penitent parent suddenly becomes a potential threat to their children’s wellbeing; every teacher to their students; every foster carer to those in their charge. The Diocese of Canterbury’s Safeguarding Ts & Cs are not an invitation to confess your sins, but an active discouragement to repentance and a manifest hurdle to reconciliation. If, for whatever reason, you feel you cannot confess your sins directly to God (1Jn 1:9), find a trustworthy and reliable friend who loves you (Js 5:16).